I had to rest the past few days because of a crackled rib. Actually, I have been told not to move but this is something not possible for me. So I decided to buy a magazine to keep me calm and my attention felt on a recipe magazine called goodtoknow, August Edition. I went through this magazine and found a recipe of Millionaire’s shortbread or chocolate caramel slice as they called it. It seems that this recipe has been withdrawn from the book “Mastering the Art of Baking” by Anneka Manning. Now that I am feeling better, I am going to give a shot to this bomb full of calories. Anyway I am not in a diet, I can always go for a walk tomorrow (a run is maybe more appropriate…). I didn’t have self raising flour so I used 100g of plain flour with baking powder. Pre-heat the oven to 180°C. Line the base and sides of a shallow 18 x 28 cm tin with a piece of baking paper. Sift the flours together into a medium mixing bowl. Stir in the coconut and sugar and make a well in the centre. Add the butter and use a wooden spoon to stir until well combined. Use the back of a spoon to press the mixture firmly over the base of the lined tin. Bake for 12-15 mins or until lightly coloured. Set aside. To make the filling, combine the condensed milk, golden syrup and butter in a small saucepan. Use a wooden spoon to stir constantly over low heat for about 10 mins, until the mixture boils and darkens in colour slightly. Immediately pour over the pastry base. Bake for 15 mins or until golden brown. Transfer to a wire rack and allow to cool in the tin. To make the topping, combine the chocolate and butter in a heatproof bowl over a saucepan of simmering water. Stir with a metal spoon until the chocolate has melted and the mixture is smooth. Remove from the heat and cool slightly. Remove the slice from the tin. Spread the chocolatey topping over the cooled filling using a palette knife. Set aside at room temperature until the chocolate has set. Cut into squares or fingers to serve. I have just tried to eat one square and it is so yummy!!! 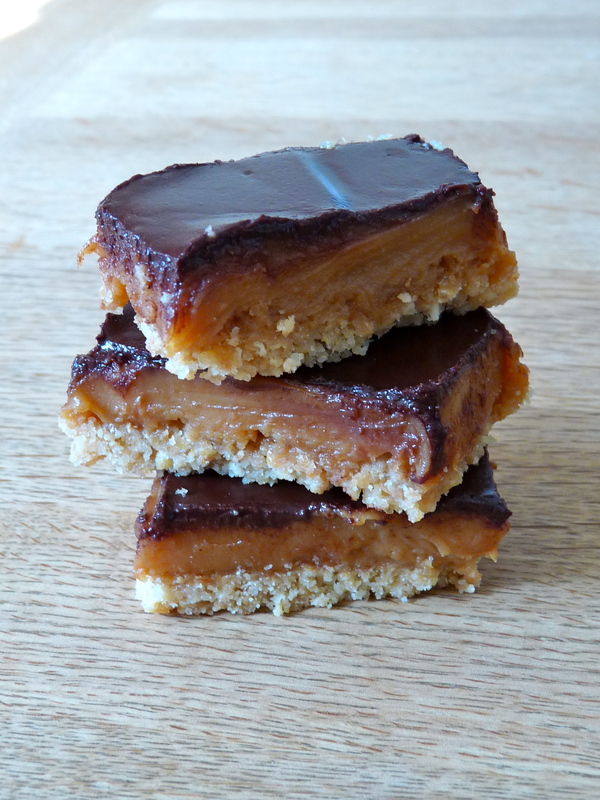 This entry was posted in Recipes and tagged Millionaire's shortbread by thebloodyfrog. Bookmark the permalink. Oh, this is so good–loved it when I was in the UK. I have never made it because I don’t trust myself and it’s just too decadent! This was my first time and they couldn’t be better. I was reluctant at the beginning but after eating the first one, I don’t regret! Hahaha! And I don’t know how to read cup/oz! This is maybe something I can improve in my future posts. I wouldn’t prevent you from trying some recipes.